I’ve started buying wine three bottles at a time. I noticed that in hockey when a player scores two goals in a game the crowd cheers, impressed by the accomplishment, and then sits down. But three goals is another story. Three goals has its own name – the “Hat Trick”. 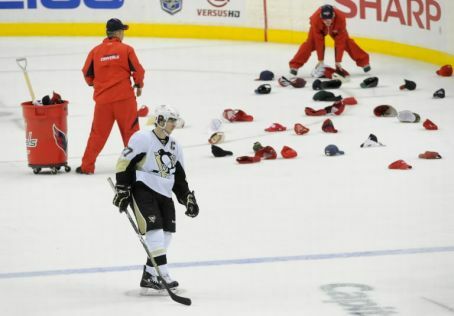 Nobody throws anything for 2 goals but people literally remove their headgear and throw in on the ice in celebration of the third goal! There is something about that third goal that is specialer. So now I buy my wine in threes – or in “Hat Tricks” as I now call them. “One to try, one to keep for later, and one to share” is my motto. Or if the wine is exceptional my motto is “Hat Trick! Hands Off it’s all mine” and I drink all three myself (not in the same night). If it’s bad then the rule is “One to try, two to give away“. So if I bring wine to your house you might want to ask which rule I followed. What do they do with those hats? This entire Mystery was unravelled using only Wikipedia as a source – so you know it might be accurate. Congratulations to the Dallas Mavericks who won the NBA title last week. Especially congratulations to owner Mark Cuban who celebrated with a 30 litre bottle of “Ace of Spades” Champagne at a Miami nightclub. That’s celebrating. I guess spending $90 000 on a Champagne when you are worth 2.5 BILLION dollars is normal. He also left a $20 000 tip. So I started researching this enormous bottle of Champagne and came up with some answers and more questions. 2. How much ice does it take to chill 100 lbs of Champagne? Probably a lot. 3. Why did Mark Cuban pick this particular Champagne? Ah, this became interesting. It appears that “Ace of Spades” is the BLING of Champagne in pop culture because of a spat between a rapper and the Champagne house of Louis Roederer. Listen to these lyrical lyrics – “My motto, stack rocks like Colorado/Auto off the champagne, Cristal’s by the bottle” – proclaimed by Jay-Z in 1996. Beautifully written no? I never would have thought of rhyming motto with Colorado and bottle! But I’m no poet. Eeek – the French can be so tactful. A cry of “racism” from Jay-Z and the affair was over. It’s probably for the best though. 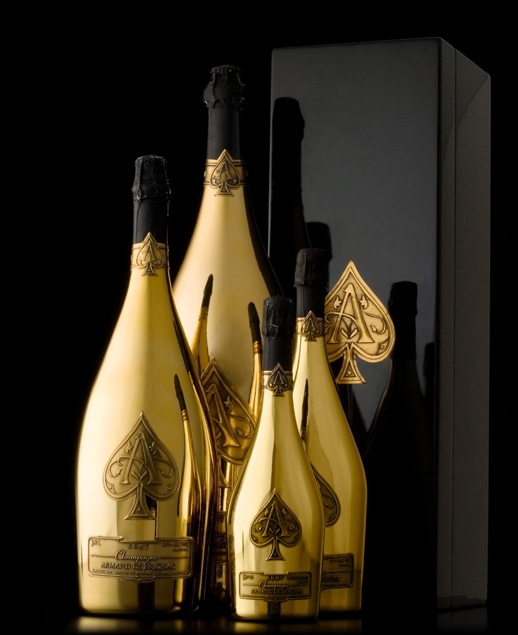 “Ace of Spades” is the luxury of luxuries with its gold bottle and high price tag. So Mark Cuban, you bought this bottle because … A. You are wealthy (to be completely accurate a wealthy computer geek) B. You have the best German basketball player in the world on your team C. A Frenchman insulted an American rapper and D. Somebody in a nightclub in Miami knew you would spend $90 000 on a single bottle of bubbly. At least according to Wikipedia. 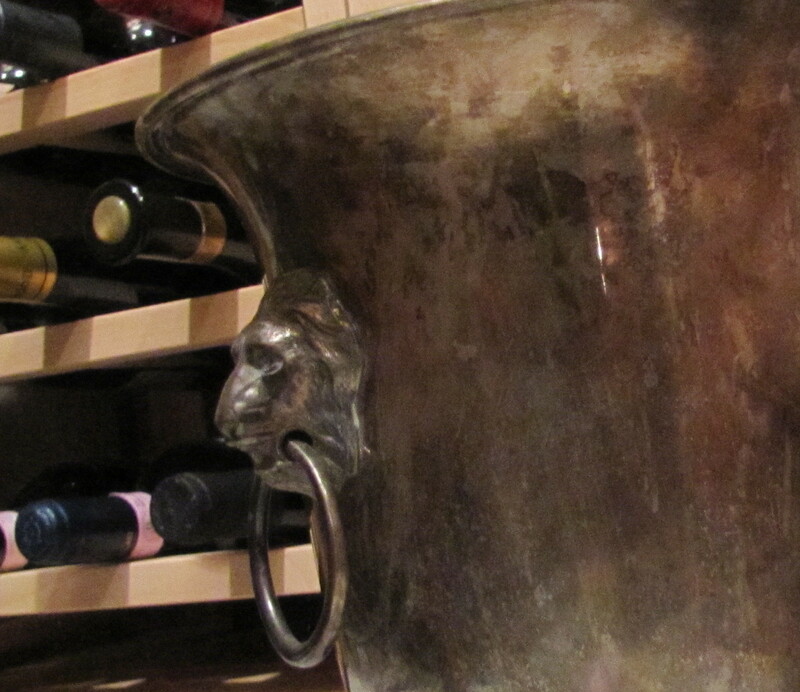 Ace of Spades - the new "bling"
I bought this fantastic wine bucket at Chat Noir in Guelph. It has renewed my commitment to white wine because it’s fantastic and I want to show it off. Also, white wine is tasty. Who doesn’t love getting the gift of wine? We have friends who spent a year in New Zealand – so when they gave us a wine from “the other down under” I got excited. The closest I’ve been to New Zealand is the Lord of the Rings Trilogy. Our friends brought us a bright Sauvignon Blanc from the Wairau River. This gift also restored my interest in Geography. I know so little about NZ that I didn’t even know they had rivers! New Zealand | Wairau River Wines Ltd. This Sauv Blanc was vibrant (I think I use that word correctly) and crisp with lively acidity (now I’m more certain that I used vibrant correctly). This makes a nice gift if you ever come over to visit. 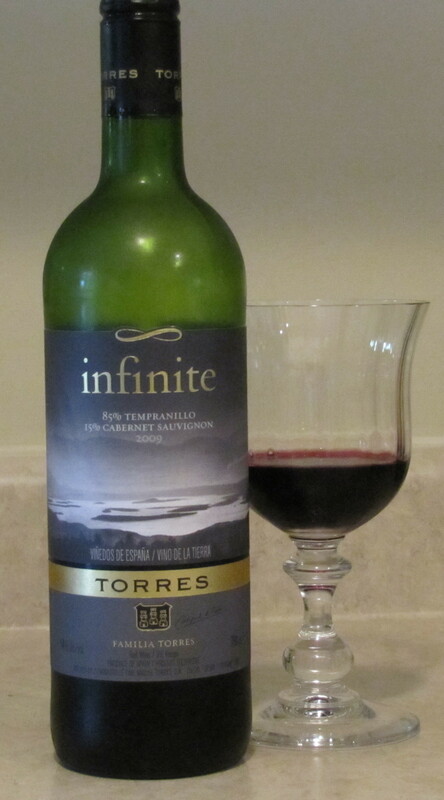 Senior Torres is at it again – hitting the market with a $12 bottle of Tempranillo and Cab Sav wine – Torres Infinite – that is delicious and tastes like a good $12 bottle of wine . That may not sound like a compliment but it’s meant as one. I have bought many $12 bottles that should have been priced at $5 so that I could have overlooked them as cheap and poorly made instead of buying them and being thoroughly disappointed. I hope this doesn’t sound like a backhanded compliment but as I was drinking this wine I kept thinking, “This isn’t bad” and realizing that it was in fact quite good. Not too much fruit – but good Tempranillo fruitiness. Not too sharp – but nice tannic finish. It doesn’t taste like a $30 wine – but it would be great at a BBQ with steak or burgers. If you live near downtown Guelph – and who doesn’t want to? – it’s annoying that you have to drive to a decent wine store. No longer! 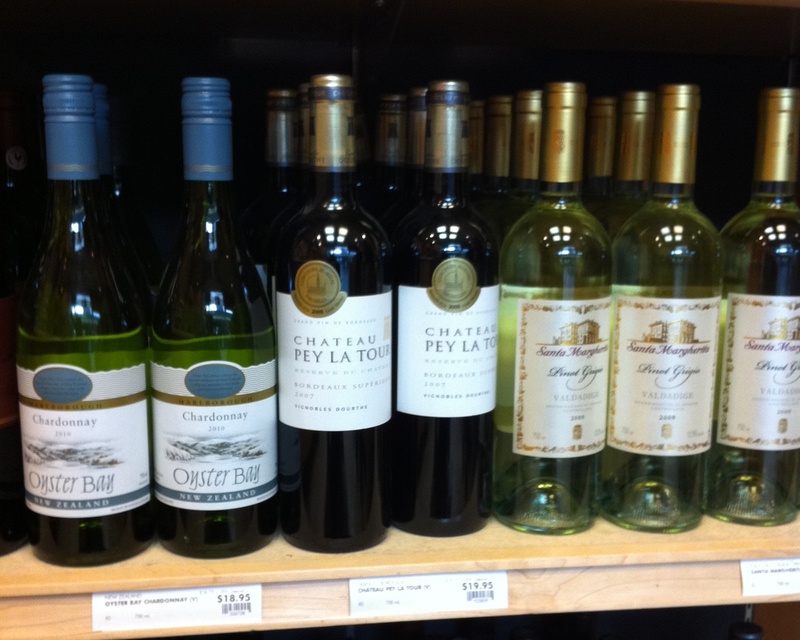 The LCBO downtown is under new management and they are bringing in a great selection of Vintage quality wines. So yes, now you can always go downtown. If you’re like my Mom, you have that Petula Clark song in your head now. “When you’re alone …” I am a little embarrassed to say that groundskeeper Willie’s tryout with the B-Flats sings in my head. Homeric references aside, the wine selection is pretty good. 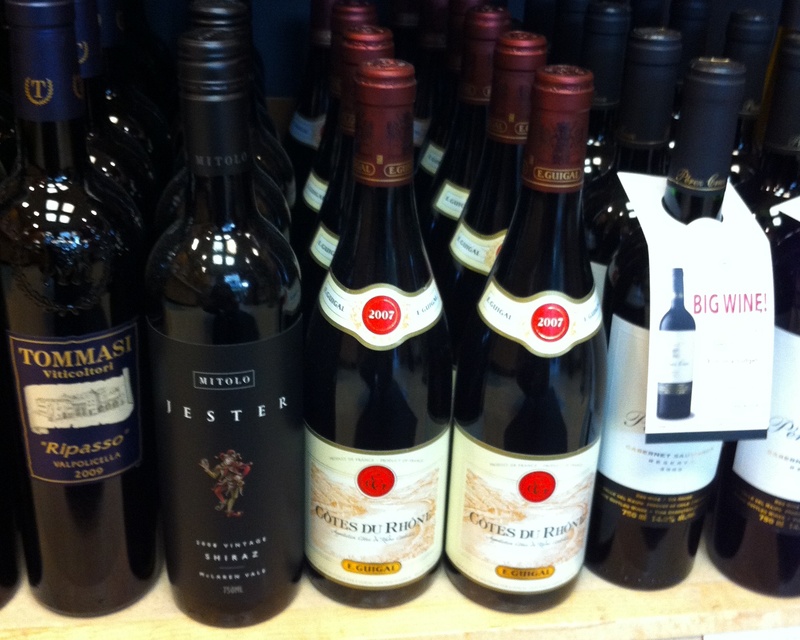 Guigal Cotes du Rhone, several high-end Ontario wines, and all within walking distance. Another victory for the downtown over the south end – or as I call it, “North Milton”. 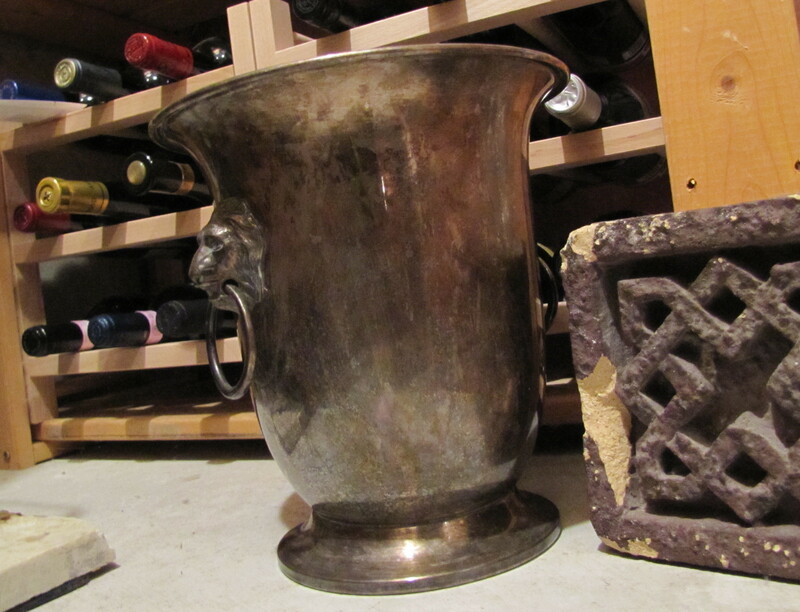 I recommend the Guigal Cotes du Rhone – great producer, region, and year – and the Oyster bay Chardonnay – serve it cold.